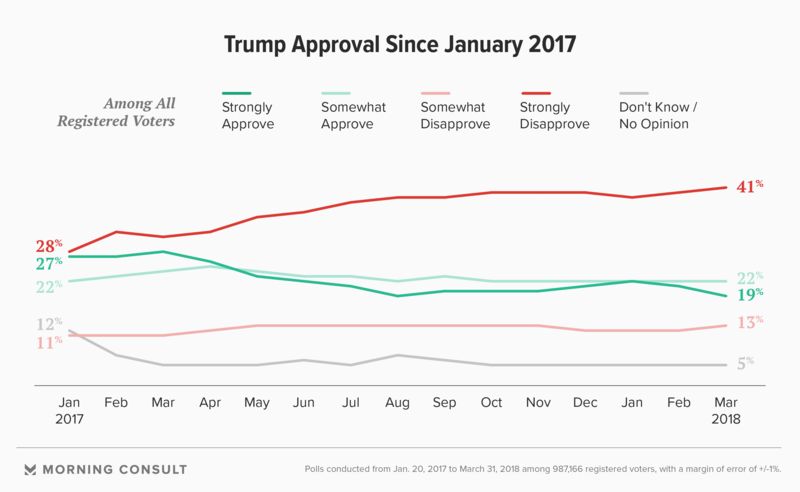 Trump’s net approval rating was 13 points underwater, a 4 point decline from February. Biggest drop was in Iowa — a net swing of 9 points from the previous month. At the state level, some of the biggest negative swings in net approval came from places that backed Trump in the 2016 presidential election: Iowa (minus 9 percentage points), Idaho and Tennessee (minus 6 points), and Montana and Oklahoma (minus 5 points). On the positive side, Trump made a 6 point gain in New Hampshire and improved his standing in West Virginia and Vermont by 4 points. Along with Sens. Joe Manchin (D-W.Va.) and Jon Tester (D-Mont. ), who are seeking re-election in November, other Senate Democrats defending seats in Trump-won states also saw mixed results in terms of the president’s approval ratings. In Ohio, Trump dipped into the red, posting a 5 point loss in net approval since February, while falling 3 points deeper into the hole in Pennsylvania and Wisconsin — to minus 8 points and minus 12 points, respectively — and dropping the same amount in Michigan, to minus 13. In West Virginia, Trump sports a 26 point net approval rating, and in North Dakota he improved to 10 points above water. 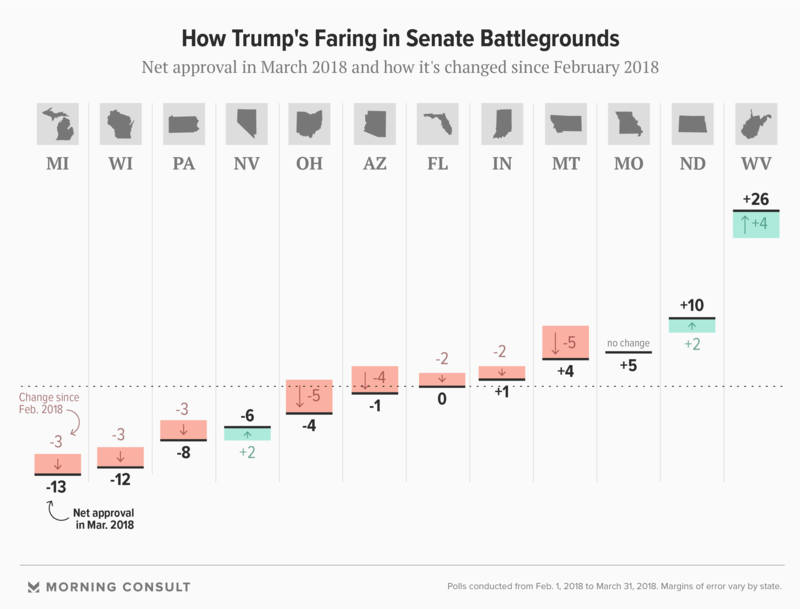 March was also a mixed bag for Republicans, who are trying to retain Senate seats and improve on their 51-49 majority in the chamber. While Trump’s approval fell into the red after a 4 point drop in Arizona, where there’s an open-seat race to replace retiring Sen. Jeff Flake (R), Trump has pulled to within 6 points of breaking even in neighboring Nevada, where Sen. Dean Heller (R) seeks re-election this fall.